The nights are longer and the weather is colder: winter is officially here in the UK. As the weather conditions deteriorate, a lot of landlords worry about their properties and potential maintenance issues. To ensure your property stays in shape this winter, here are some essential tips to help you out. Don’t get caught out by the cold weather. Protect your property early this winter. There is only one place to begin, and this is with talking to your tenants. Maintaining a good relationship with your tenants means they are going to be much more likely to make a dedicated effort to keep your property in good condition. 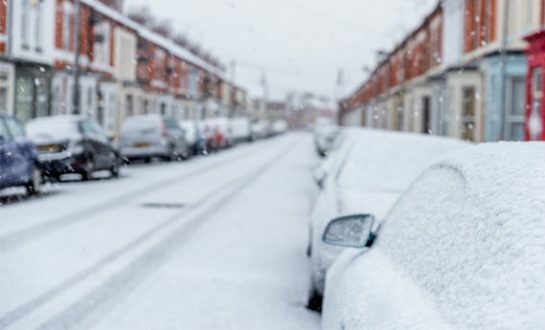 If local flooding or heavy snow looks likely, talk to your tenant about an emergency plan and give them numerous ways to get in touch with you. You should also ask your tenant to inform you if they are going to be leaving the property unoccupied for 14 days so that you can pop around and carry out essential maintenance to stop the pipes from freezing. You may also want to ask your tenants to leave their heating on low while they are absent or to set the timer so that it comes on at a specific time each day, therefore preventing frozen pipes. There is nothing worse than receiving a call from your tenants on Christmas Eve because the boiler has broken. While it is a legal requirement for all landlords to have a Gas Safe engineer check the gas systems on an annual basis, it is also wise to get the boiler fully serviced so you can ensure there are no issues over the coming months. The radiators may also need bleeding. This is a simple task that your tenants can do themselves. Winter is the most expensive time for heating and energy bills. The heating bills go up due to more hours of running the boiler in the colder months. Electricity bills go up also as people spend more time indoors. Do you provide the utilities for your tenant? If so it might be a good time to switch suppliers. At Lettingaproperty.com we’ve teamed with Uswicth to assist landlords to find the best possible deal. You can save hundreds of pounds per year by taking 5 minutes to switch to a cheaper supplier. See how much you could save. While it might seem like the best idea to keep all the windows shut to keep the heat in, this greatly increases the risk of condensation. That can lead to damp, which is something you really don’t want. Open windows strategically to ensure the best airflow through the whole house. You don’t need to keep them open all the time, but if you see condensation on any windows you should always open them for a short time to dry out the air in the property. Preventing black mould from appearing in the first place can save you a small fortune in damp repair costs. If there is heavy rain, missing or broken guttering can be a big problem because the water may not be directed away from the house efficiently. You need to replace any missing guttering and end caps, as well as ensuring the current gutters are free from debris such as moss and leaves. Now is a good time to give your property’s pipes the once over. You need to make sure the joints are secure and that there are no leaks. Ensure pipes are properly insulated so that they do not freeze and burst in the cold weather, and use putty to seal any small cracks. The final thing to do at this time of year is to address your landlord insurance policy. Of course, it is critical to have this in place and make sure you have all of the coverage you need. If your rental property is damaged by a storm or a flood, you should be covered by contents insurance and landlord buildings insurance. In the winter, property owners’ liability insurance can be especially beneficial because accidents are more likely during this time of year and the correct policy can ensure you are covered if you get the blame for any damage or injury. So there you have it: A few tips to help keep your rental property in tip-top shape this winter. If you follow the advice and suggestions that have been presented above, you can go a long way to ensuring you do not have any expensive and troublesome problems with your rental property throughout the coming months.